So we found an apartment and got moved in less than a week! As I mentioned before, we had to be out of our last apartment super quick but were having a hard time finding something that was a good mix of location, space, and price. Just when we were beginning to give up hope, we found our new apartment just TWO BLOCKS away. What a short move! With the new apartment so close, we were able to skip the Uhaul and drive our stuff over in our SUV. We even walked a few things here...it's just a three minute walk! The new place is quite small compared to our last apartment (1000sq ft smaller to be exact!) but it's super cute, has vintage charm with modern updates, and is perfect for us! Downsizing hasn't been easy, lots of our furniture will end up on craigslist, but it feels good to finally be in an apartment that we love and can see ourselves staying in for a couple of years. To make things extra awesome, the landlord has a panel saw in the garage. I might live here forever! The hardest part of the move was getting the 500lbs. vintage tanker desk I so lovingly restored from one apartment to another. We ended up knocking a whole in the wall trying to get it upstairs. When I said "up" I meant straight up while Jerome thought I meant forward. Apparently communication is key when moving large objects! 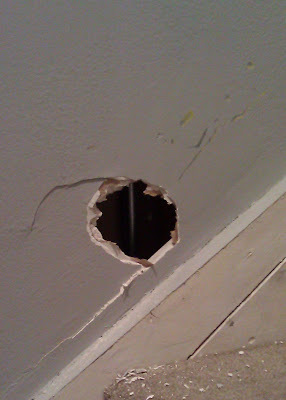 So is mind power...after knocking the whole in the wall, we realized we could just take the desk out the back door and have only five stairs to deal with. Oops. Though I didn't have time to snap pics of the rest of the house before we moved our stuff in, I did take some quick pics of my prized desk so you could see it before it was covered in junk! Before: Relatively good condition with minor rust, though the grey painted finish was gone in many spots. After: I LOVE the color! The yellow is actually a little deeper in person. The left cabinet has a pull out typewriter stand that I use for my printer. Above the three right drawers is a pull out tray. It took me about two weeks to refinish the desk but it was worth it. 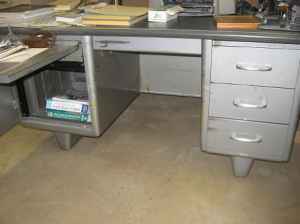 When restoring a tanker desk, they tell you to treat it like a car. Most people take them to auto body shops and have the desks professionally sandblasted and painted. Unfortunately that wasn't in my budget which meant a lot of time spent reading car forums, getting materials at Pepboys, and a lot of sanding, painting, and wetsanding down to a perfect finish before waxing and polishing. Talk about tedious! I loved the outcome so much I'd happily do it all over! Congrats on your new place. Your desk looks absolutely awesome!! I LOVE the color and when I first saw the photo I thought "that looks like a professional powder coat paint job". You did a wonderful job. Thanks for posting about it. Thanks! I'm super proud with the outcome. Patience isn't my strongest asset so I was a little worried I'd never make it through this project but now that it's done, I love it! You should see the cars this guy from the car forums restored using the same process. I'll post his pics soon. This is EXACTLY the same desk I bought today. The foldout was a nice surprise. I some how talked my brother into coming with me to grab "a little desk I bought off of Craigslist"...he's not too pleased with how heavy it is. When we got it home, my husband and I managed to get it into place, only needing minor drywall repair. We had millimeters of clearance in the doorways. I'm wanting to restore/rehab it. No major dents, but some surface rust that I need to address. Any advice? Auto body shop is out of the question for me. Yours looks absolutely awesome. Can't wait to get started! Ha...that sounds just like how I got my husband to go along with getting MY desk! Thank God they love us! Apparently I never got around to posting the DIY tips for refinishing. Sorry! I'll do my best to remember all the steps and post something later. In the meantime, here are the basics. Our desk had barely any rust so we didn't have much to worry about. I sanded the whole desk, paying special attention to the few rust spots. Then I used Rustoleum bare metal primer (thinned with mineral spirits). After that, I spent the next week going back and forth between painting super thin coats of yellow (again thinned with mineral spirits) and wet-sanding, making sure to increase the grit every day until I reached 2000 for the final sand. The last step is to polish and wax. If you prefer to leave the metal as is, you could just sand the desk down, buff out any rust, and either wax/polish or add a clear coat of Rustoleum.